On a dismal afternoon for football, Little Common made their longest journey of the season worthwhile with a 2-1 success at Selsey. Goals from Jared Lusted and Lewis Hole gave Common their first Macron Store Southern Combination Football League Division One away victory since August on Saturday. Despite the torrential rain which had saturated most of Sussex, the pitch at Selsey was in excellent condition and the completion of the fixture was never in doubt. The wind and rain certainly did not make for an easy afternoon, but a Hole goal 15 minutes from time was enough to see the Commoners extend their recent good run of form. Common defended the wind for the first half and it was no surprise that the home side looked the brighter in the early exchanges as Common struggled to clear their lines and get a foothold in the game. Selsey should have taken the lead after just two minutes when some slack defending presented an early chance for the home winger, but he dragged his effort wide. The same player was once again guilty of a missed chance moments later when Common goalkeeper Matt Cruttwell was on hand to deny him with his legs. Common gradually began to find their way into the match and some neat link-up play saw Hole denied by the home goalkeeper before Dan Estherby saw an effort clear the crossbar. It was Common who opened the scoring in the 25th minute when Kyle Holden’s throughball found Lusted, who cut in from the right before slotting the ball into the net. Chances came and went for both teams. Cruttwell was on hand to push an effort over the crossbar before another Selsey shot fell agonisingly wide, while at the other end, Holden saw a goalbound effort blocked before Hole’s attempted flick over the goalkeeper was foiled. With the wind and rain intensifying in the second period, the Commoners saw their lead wiped out in the 55th minute when an unmarked Jake Lintott rose to head home from a Selsey corner. The Commoners responded to the setback by enjoying their best spell of the match, albeit without creating too many chances. Jamie Crone blasted over from a tight angle before rounding the goalkeeper only to see his goalbound effort blocked on the line. Common did get the breakthrough in the 75th minute. 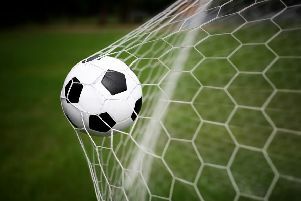 A reckless tackle on Hole allowed Russell Eldridge to deliver a swirling free kick into the box and an attempted clearance fell to the feet of Hole, who made no mistake from eight yards. It was the Commoners who looked the most likely to add to the score, with Lusted seeing an effort fall wide before Hole had an effort gathered by the home stopper. Selsey never really threatened in the closing moments and the Commoners held on for maximum points. Common: Cruttwell, R. Mote (Curteis), S. Mote, Brown, Ammoun, Lusted, Holden, Hole, Crone (Wells), Estherby.